At Noble Locksmith, we are committed to providing you with exceptional service at competitive rates. As a trusted La Mesa locksmith, you can call on us for any type of service you need and expect that we will provide outstanding results. We sell, service, repair, and install locks for most needs. As a certified locksmith, our La Mesa, California customers know they can depend on us to provide a high quality of service and workmanship. Noble Locksmith provides comprehensive services throughout the La Mesa, California area. Our services including servicing and rekeying all types of high-quality lock hardware including from name brands such as Schlage, Kwikset, and Master Lock. All of our locksmiths have undergone extensive and ongoing training, and we are certified, insured, and registered. Whether you need us to pick a lock so you can gain entrance into your home or you are just moving in and need new locks installed, Noble Locksmith is the only professional you need. Our team is happy to help you with all lock and key needs for homes including replacing existing locks, deadbolt installation, and even rekeying hardware. We encourage you to replace your locks whenever someone moves out of your home. However, we can also repair most locks if they stop working. We encourage you to let our team help you add the security you need to make your home feel safe. We provide complete mobile locksmith services as well. This means we can be there to help you with any needs you have even if you’re locked out of your car. This includes car key replacement, car remotes, and key fob replacement. 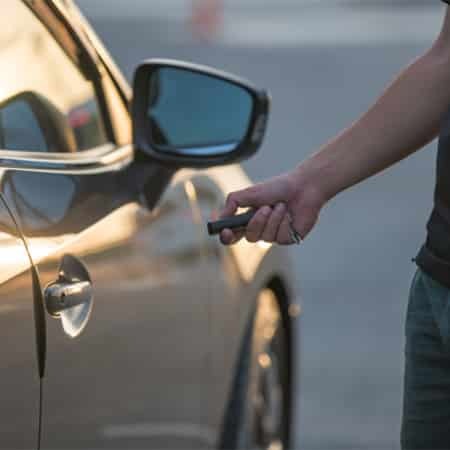 We are a 24-hour mobile locksmith – we can help you if you are stuck and need help right away. As a residential locksmith, Noble Locksmith is able to help you with all types of security options for your home. We can help you replace existing locks. Or, we can enhance the security of the existing locks with the addition of a deadbolt. Our team can also help with rekeying existing locks so that only new keys work in them. We also offer key duplication services when you need a new key made. Let us help you find the right option for replacing or updating your locks. You can also trust us for car key replacement as well as key fob replacement. We can help if your locks do not work or you need car remotes. We are the 24 hr locksmith you need. Call Noble Locksmith now for fast, reliable help.